Caruso’s Dream, Brian Goggin and Dorka Keen. Photo by Michael Rauner. Life Death/Knows Doesn’t Know, Bruce Nauman. Photo by SFMOMA. Murmur Wall, Future Cities Lab. Photo by Tommy Lau. 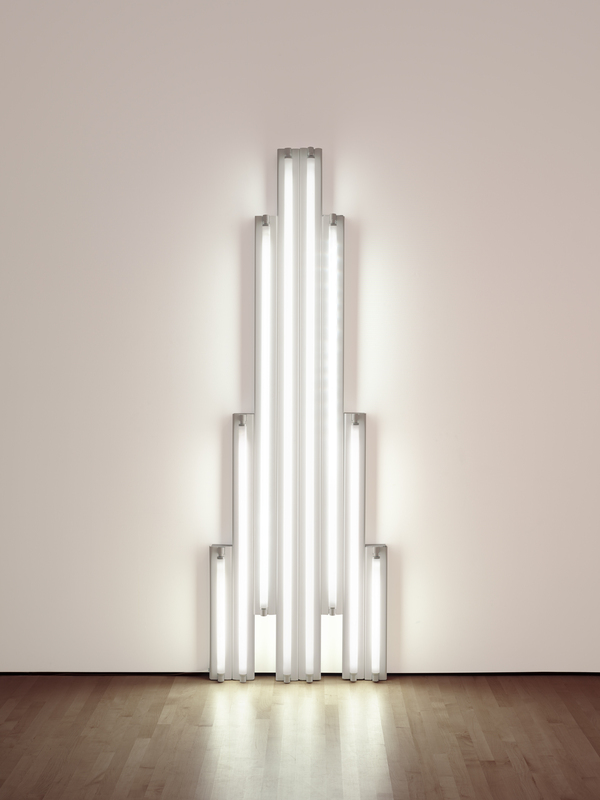 Monument for V. Tatlin, Dan Flavin. Photo by SFMOMA. Yud, Daniel Libeskind. Photo by the Contemporary Jewish Museum. Bayview Rise, Laura Haddad and Tom Drugan. Photo by Robert Burns. San Francisco is aglow. 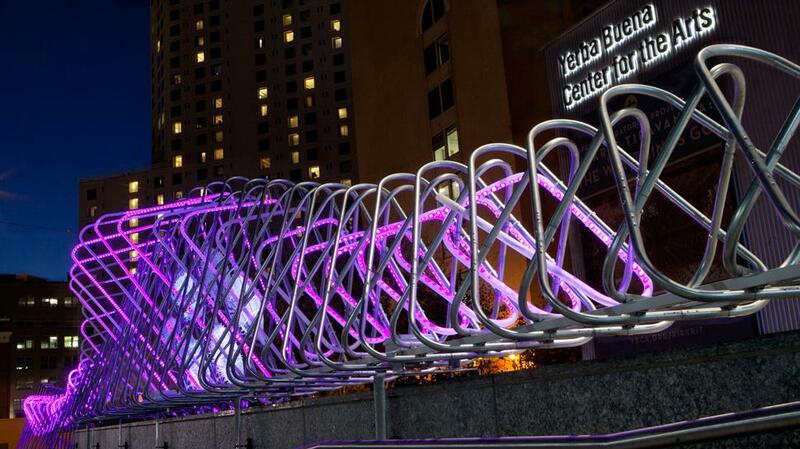 Throughout the years, the bay-side city has cultivated a plenitude of eco-friendly light installations. 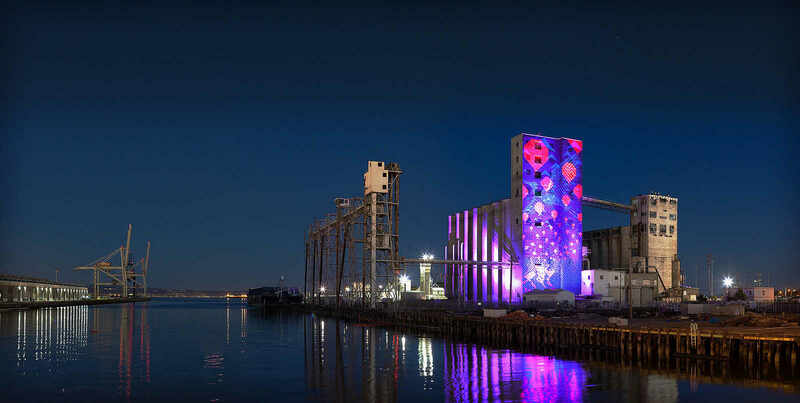 To celebrate the sparkling cityscape, the fourth annual Illuminate SF Festival of Light hosts a series of events showcasing 35 installations until New Year’s Day. In addition to Presidio-set stargazing, guided tours take visitors through 12 neighbourhoods (from the waterfront Embarcadero to Golden Gate Park-parallel Inner Sunset), and museums (such as the de Young Museum and the San Francisco Museum of Modern Art), led by a cultural concierge and selected artists. A myriad of works await. 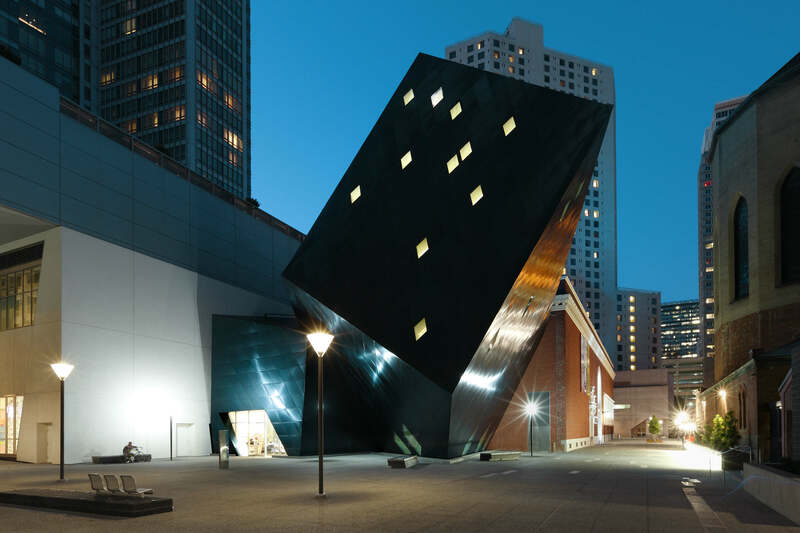 Twenty-five installations have made a permanent home in the city (such as the Daniel Libeskind’s Yud at the Contemporary Jewish Museum, a spattering of diamond windows refracting sunlight) and at the airport (where the miniscule mirrors in Wind Portal by Ned Kahn glisten)—and more pop up, if only briefly. 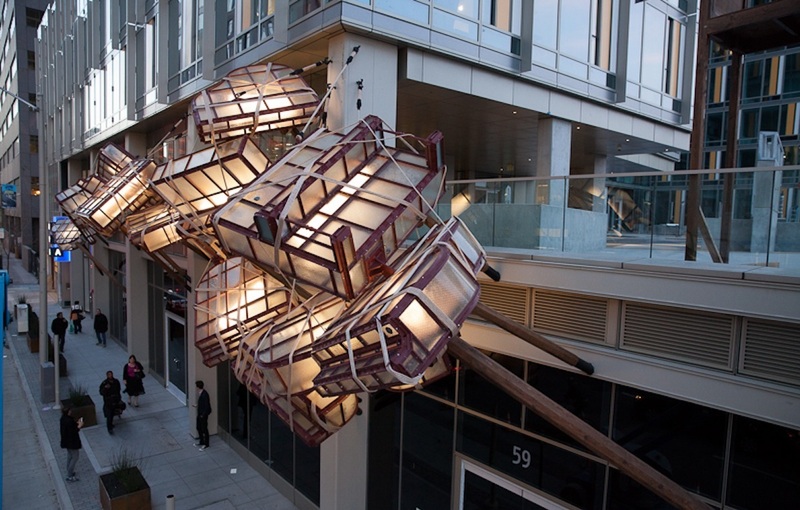 This year, the festival exhibits nine new temporary installations. 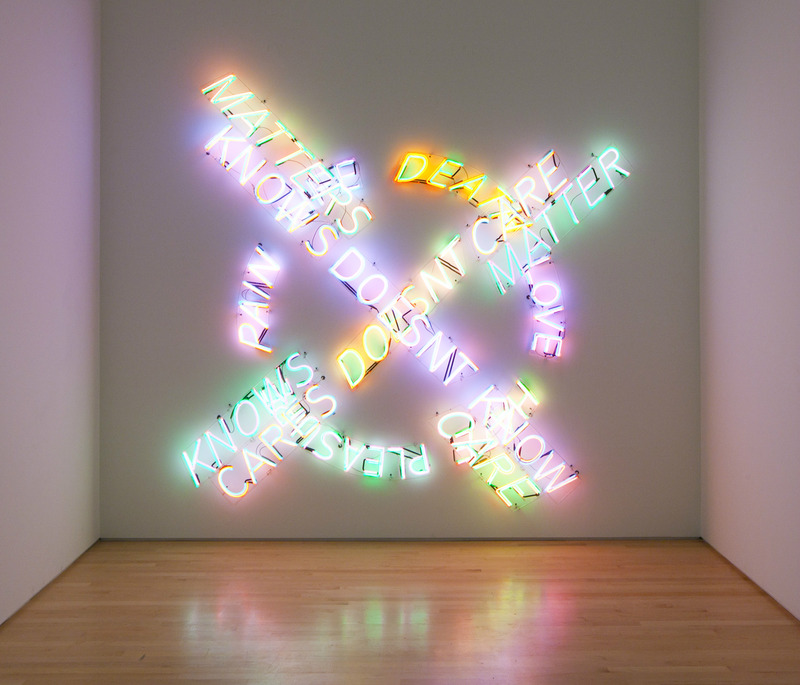 Four are located in the SFMOMA’s Pop, Minimal, and Figurative Art collection (particularly intriguing is Bruce Nauman’s Life Death/Knows Doesn’t Know, a neon structure confronting the viewer with a flashy display of impactful opposing words), the remainder are scattered around the city. At the entrance to the Yerba Buena Center for the Arts, for instance, Murmur Wall by San Francisco–based Future Cities Lab features scrolling “whispers” across screens, carrying a conversation from various sources: messages submitted through a website set up for the artwork, trending search engine topics from the surrounding SoMa area, and phrases curated by YBCA. Epitomizing the spirit of the festival is Brian Goggin and Dorka Keen’s permanent piece, installed in 2014 and titled “…and my room still rocks like a boat in the sea” (Caruso’s Dream). The 13 suspended pianos were inspired by famed Metropolitan Opera Company tenor Enrico Caruso’s experience during the city’s 1906 earthquake, which rocked his hotel room. The pianos cast a faltering, Tinkerbell-like glow in synchronicity with a radio broadcast of Caruso singing a dynamic libretto, giving depth to its crescendos and diminuendos. Illuminate SF Festival of Lights not only calls attention to installations and museums, it also guides passersby to corners of the city both quiet and bustling, encouraging dialogue about deliberate works of art as well as the creative spirit so entrenched in the city. Illuminate SF Festival of Light is on now until January 1, 2017. Full list of tours and events can be found here.